My husband and I have been blessed to have spent almost two months of our lives in Italy and we of course plan to go back many more times. As I'm sure you've assumed, or you know from experience, the food in Italy is one of the main attractions. If you know what to try and where to try it, Italy can have some of the most amazing food in the world. 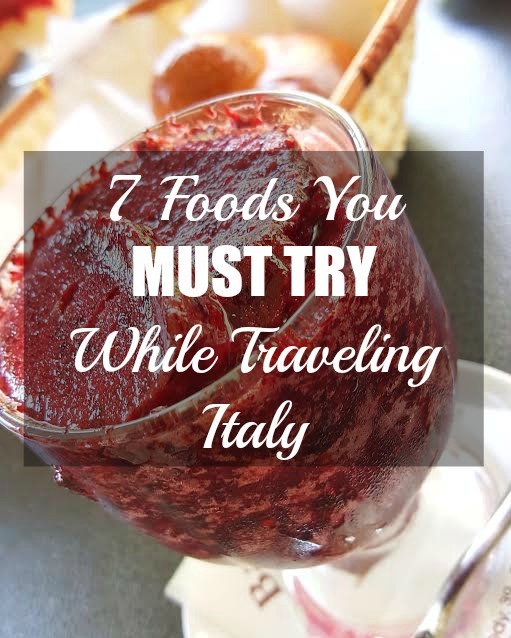 In this post I bring to you seven foods you MUST try while traveling through Italy. Each food is specific to a region or city, so make sure to try it where it's famous. Different places throughout Italy are "known" for specific foods, so while we traveled we made sure to try each locations popular food item. I hope you get the chance to try these tasty treats, my mouth is watering just writing this post and thinking back on our fond foodie memories. Arancine are rice balls that are stuffed with meats and sometimes cheese. They are not a healthy snack or meal but they are delicious. We have had arancine in a few different places, but it is the best in Sicily. Sicilians pride themselves on having the best arancine, and rightfully so. One night I opted for grilled chicken for dinner instead of arancine ( I was trying to be relatively healthy, since gaining weight can be part of your Italian adventure), and let me tell you I had buyers remorse. I took a bite of my husbands fried rice ball and instantly regretted my healthy decision. I won't make that mistake next time. Carbonara is a Roman pasta dish that is made with eggs, cheese, bacon and black pepper and it's usually made with spaghetti noodles. I have tried carbonara in the U.S. and I remember I didn't like it. I'm sure there are some restaurants here that make some great carbonara, but I must say I wasn't a fan. Then I tried the carbonara in Rome and just loved it!! I didn't order it because I thought I wouldn't like it, but when I tried it off my husband's plate, I just loved it. The trend here seems to be that I should just simply order whatever Nick orders haha, aka trust the Italian. Our favorite restaurant for carbonara in Rome was Navona Notte, if you are in Rome give it a try. We stayed in Rome for a week this last trip, trying different restaurants everyday and for our final night in Rome the whole family agreed we should go back to Navona Notte. Before we went to Cinque Terre, I did some research on what to do, see and eat. Pesto kept popping up so I knew I needed to have some while we were there. Rick Steves, a travel guru, recommended the pesto and explained in on of his videos that Cinque Terre was actually the birthplace of pesto. Basil, the main ingredient in pesto sauce, is grown in the region, so it is extremely fresh. I tried pesto pasta two nights in a row, and we also had some pesto pizza. It was all delicious and I understand why they rave about the pesto in Cinque Terre. So delicious. I've talked about this before in my what to do and see in Amsterdam and Italy post, so you can also check it out there. Basically aperitivo is a buffet of food and drinks that is serves before the normal dinner time. You get to try a ton of different foods rather than picking one dish, and it's super inexpensive. You will pay around 7-10 euros for a drink then you will have access to the buffet of food. Make sure to do research on the top places to eat aperitivo instead of just walking into the first place you see that is offering it... which we unfortunately did. Oops. Well, the nice thing about my blog is you can come here to learn from some of my travel mishaps haha. Nduja is a spicy pork salumi ( not a typo, salami is a type of salumi) that is spreadable. We know about nduja because of our Calabrian family. Calabria is a region in southern Italy, and there they eat a lot of nduja and oh my gosh it is delicious. The nduja I have tried was very spicy, which happens to be why I love it so much. It's great alone, with cheese, on bread, and we even had nduja on some pizza which was amazing. If you travel to southern Italy, make sure to go to Calabria, it is an amazing part of Italy, specifically Tropea. To me, this is the perfect Sicilian breakfast, especially if you are there in the heat of summer. This is seriously the most delicious thing ever, I wish I could send samples to you through my computer. Granita is like a mix between ice cream, a milk shake, Italian ice, but so much better than all of those things. It is eaten in Sicily for breakfast with a brioche, which is sweet bread that they often split in half and put granita in. If you are ever in Acireale or Catania make sure to stop into Bar Kennedy for granita and brioche. Our cousins took us here and it is delicious. They also have wonderful coffee. My favorite flavor of granita was the almond. If you are a tourist going to Italy from somewhere like the U.S. then you probably won't be visiting Pizzo since it is a smaller town in southern Italy (Calabria). However if you are nearby then I suggest going, our family has taken us there twice and I think it's an adorable Italian town by the sea. Pizzo is known for their tartufo and trust me once you step into town you will know that. There are signs for tartufo everywhere and I would say every restaurant there seems to sell it. Tartufo in Italian means truffle. It is an ice cream dessert that usually has two or more flavors and has a syrup on the inside. The syrup is either chocolate or a fruit syrup. It usually has a shell of chocolate or cocoa powder. It is delicious, give it a try. I hope you all make it to Italy someday to try their amazing food and experience their wonderful culture. If you have been, comment below and let me know what foods you discovered that I must try. Thanks for reading!